Cecil Striker, M.D. This photograph serves as a link to the finding aid for the Winkler Center’s collection on Dr. Cecil Striker. Dr. Cecil Striker earned his Bachelor of Science degree in 1919 and then his Doctor of Medicine in 1921 – both from the University of Cincinnati. He began an internship at the Cincinnati General Hospital in 1921, eventually becoming a resident in 1922. He also completed a residency at the Jewish Hospital and was Chief Resident there from 1923 to 1924. He joined the Jewish Hospital medical staff in 1925 and served as President of Staff from 1955 to 1956. Dr. Striker’s extensive involvement with research on diabetes and insulin perhaps dominates the general perception of his career as a medical professional. However, Dr. Striker was also awfully enthusiastic about the history of medicine. 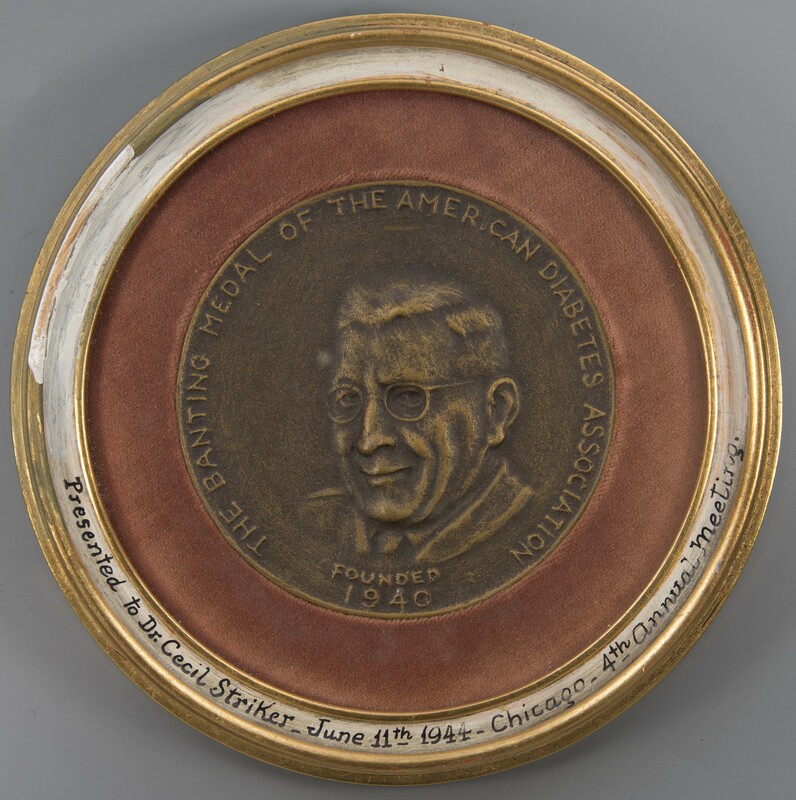 American Diabetes Association medal presented to Dr. Cecil Striker, June 11, 1944. Part of his personal collection. There is one recorded instance that Dr. Striker was given Cantagalli tiles, presumably from The Cantagalli Pharmacy. 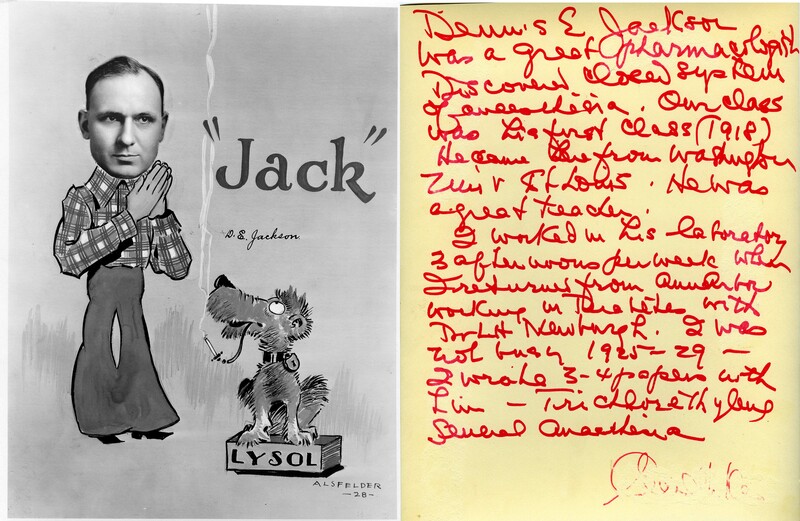 He collected a variety of interesting, somewhat eclectic artifacts including: numerous medals, many bookplates, stamps, pharmaceutical jars, and among various other things, some faculty caricatures. The caricature of Dr. J. Howard Schriver. Part of what makes these caricatures particularly interesting if not remarkably bizarre, is that their history is largely speculative and mysterious. Most of what is known can be immediately observed, and their enigmatic existence has perhaps the interesting effect of exaggerating what is already meant to be comically absurd. 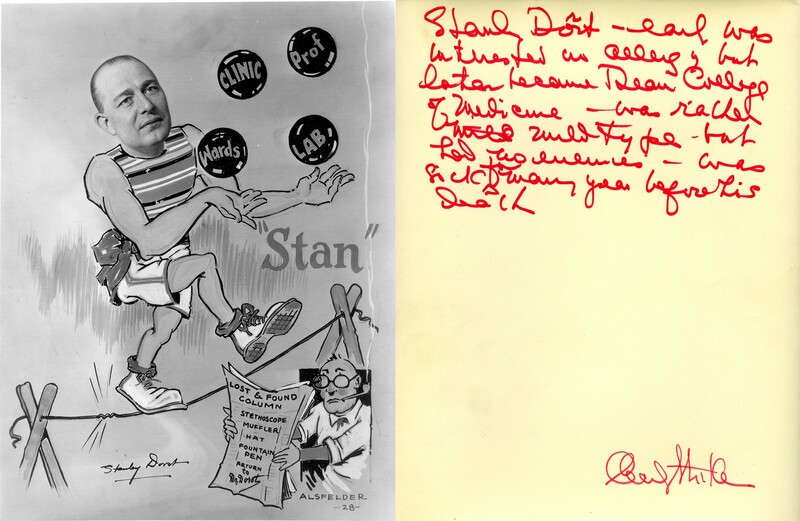 The caricature of Dr. Stanley Dorst. Unfortunately, these caricatures are not the originals but old prints. About half, some of them duplicates, have Cecil Striker’s handwritten commentary on the opposite side. 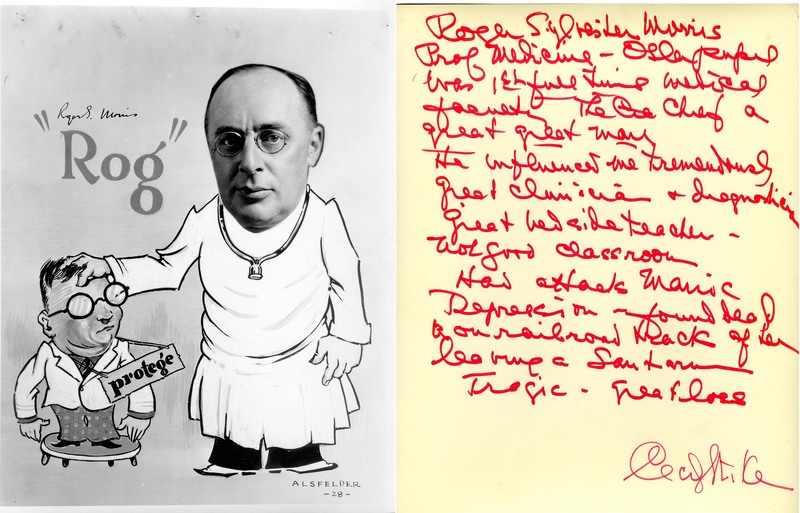 These notes identify the physician of the cartoon but are otherwise consistently more personal than factual. They seem to represent his momentary and briefly general impressions or recollections of the cartooned individual. His commentary can be severely critical; other times, excessively complementary. Striker’s signature randomly appears after only some of these notes, but Dr. Striker’s distinct handwriting, leaves little question as to the author of those notes that are unsigned. It is unclear when Dr. Striker added his notes; however, it must have been after December 6, 1972, the date of Dr. Dorst’s death alluded to in Dr. Striker’s commentary, and before his own death in 1976. The caricature of Dr. Roger Sylvester Morris. – The Chief, a great great man. He influenced me tremendously. Had attacks Manic Depression – found dead on railroad track after leaving a Sanatorium. Each original cartoon is signed “Alsfelder 28,” usually somewhere in the lower right. This is usually interpreted as the caricatures’ artist and the year the cartoons were created. Indeed, the quality and printing style is consistent with that date, 1928, and contemporary faculty. In addition, it has been speculated that “Alsfelder” was a student or perhaps the name of a company or perhaps even a pseudonym. Our records of course catalogues around this time suggest that it is doubtful “Alsfelder” was a member of the medical faculty. The caricature of Dr. Dennis E. Jackson. Commentary: “Dennis E. Jackson was a great Pharmacologist, Discovered closed system of anesthesia – our class was his first class (1918), he came here from Washington Univ, St Louis. All the caricatures are of medical faculty and each caricature incorporates a profile photo and a nick-name as part of the design. It is unclear if many of the nick-names are legitimate or fictional. 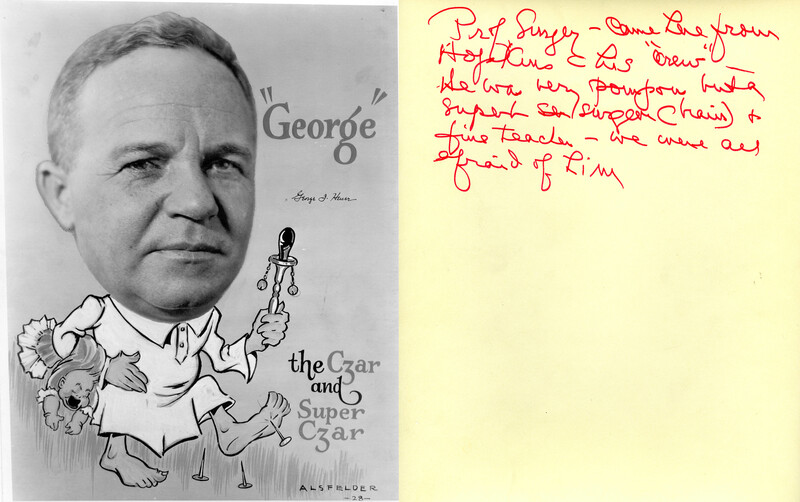 There are numerous instances also where the faculty member signed the original caricature. The caricature of Dr. Martin H. Fischer. Commentary: “Martin Fischer – Prof Physiology. Probably the most inspiring professor . It seems that individual cartoons have specific relevance to their individual faculty members. The images are not random but perhaps best described as inside jokes. For example, Dr. Martin H. Fischer was a professor, scientist, author, and artist. He was particularly interested in the science and art of oil painting. Prints of his caricature were used as the frontispiece of the first edition Fischerisms (published in 1930). Beyond that particular instance, it is thought that all caricatures may have been used in a yearbook. On March 4th, 1976 – just before his death on March 31 of that same year – Dr. Striker had loosely organized a group of individuals with the intent of forming a medical history club. Shortly after his passing, the newly formed group unanimously agreed upon the title, The Cecil Striker Society for the History of Medicine. The Society continues to honor Dr. Striker’s interest and contributions to the history of medicine. His memory and materials continue to contribute to our understanding of the history of medicine to this day. The “Alsfelder” faculty caricatures are just one example. 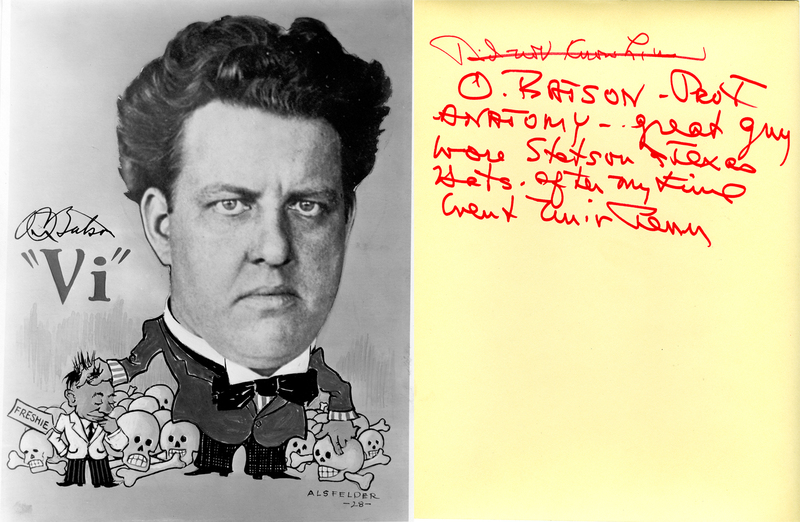 The caricature of Dr. O. Batson. Commentary: “O. Batson – Prof Anatomy – great guy Wore Stetson Texas hats. The caricatures offer an interesting and significantly informative glimpse of the character of the faculty outside of their research and general profession. The exaggeration of the cartoons ironically help us to see clearer and understand more, but each caricature is perhaps so rich with visual clues and information, that most of it regrettably goes over our heads. 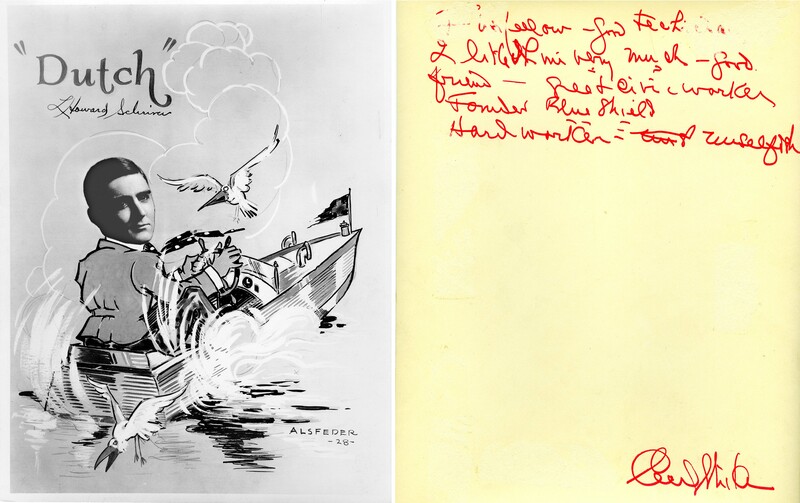 A special thanks to Roger West for scanning the caricatures and notes as well as for deciphering Dr. Cecil Striker’s difficult handwriting.